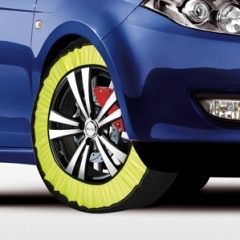 The Multi Grip Snow Sock is designed to be used on snow and ice, and is a great alternative to snow chains. Made from a synthetic waterproof fabric, the Multi Grip gives a consequent increase in the coefficient of friction between wheel and snow or ice surfaces. As a result the Multi Grip is effective on snow and ice giving a much more comfortable ride than with traditional snow chains. These are only suitable for standard Road Tyres. * A significant increase in the total contact area with snow or ice, owing to both the special textile construction and the use of multi-filament thread, with a consequent increase in the coefficient of friction between the wheel and the snowy or icy surface. * The penetration of the relief moulding, caused by the localised fusion of the snow or ice made by the increase in pressure contact in correspondence to the textile knots, which give the multigrip its exclusive "grip"
* Maintenance of a good workability even in cases of small flaws, thanks to the "run-proof" quality of the textile as a consequence, multigrip is effective on snow and ice, driving and braking are precise and stable, its long life lets you drive comfortably for relatively long distances even on roads where snow and ice patches alternate with dry asphalt.